Truth is not always pleasant, fun or convenient, but it’s always necessary in life. Without the truth of a working compass, we would be desperately lost. Without the truth of a mirror, we wouldn’t know we have spinach stuck between our teeth or an embarrassing case of bed hair. And yet, our culture continues to find ways to make us feel better about ourselves even at the cost of the truth. Last week I learned about “vanity sizing.” It’s been a known practice in women’s fashion, but it’s now part of men’s as well. In order to make consumers feel better about themselves, and potentially buy more merchandise, designers are selling items that are purposely mislabeled to seem smaller than they actually are. And I’m not just talking about half or a size difference. 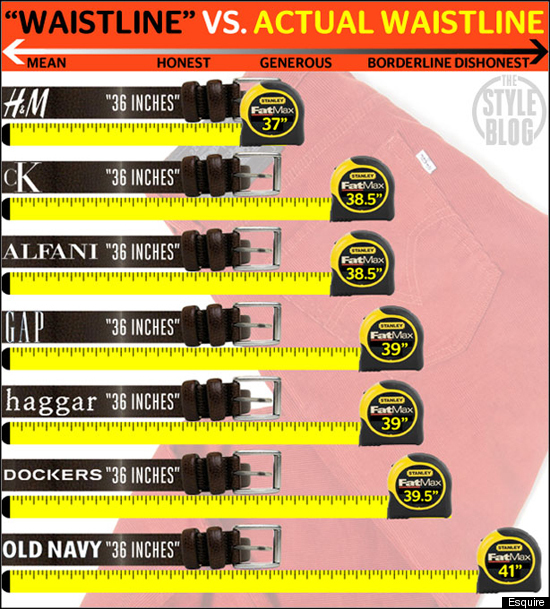 Old Navy, for example sells pants labeled 36 inch waist that are actually 41 inches. Marketers are betting on the goodwill that smaller-than-anticipated sizes will have on consumers, hopefully propelling them to buy more goods: “Hey, I can fit on a size 31 skinny jeans. Oh, I need two pairs.” But vanity sizing is a lie and those skinny jeans won’t make you look small. As a matter of fact a size 41 skinny jeans on a man will make him look like a denim ice cream cone. Sorry about the visual. So marketers are liars. That’s nothing new. But we have been playing vanity games for a long time. We tell our children they’re great singers when they’re tone deaf. We tell people we believe in them, but we secretly we don’t. We give praise in public only to tear it down privately. We hate the Simon Cowells’ of the world, but often they’re the only voices of reason. How can we grow if we are not willing to find out the truth, no matter how difficult? Honestly, vanity sizing works on me. I just bought 2 pairs of 32 size pants. I wouldn’t have bought any if they were sized 36 or even 34. But I also know that with every picture and every mirror reflection the truth is staring back at me. There are not enough skinny mirrors out there to distort the truth. When was the last time you were honest with someone? How did it turn out? I had to tell a friend to "grow up." He was in a mess and didn't want to take any responsibilities for his actions. It hurt his feelings and he withdrew, but I hope he comes around. I want to be supportive, but he needed someone to tell him that he had screwed up. Being a friend doesn't mean excusing bad behavior. You took on a tough topic. Truth-telling is swimming against the tide and one has to develop a strong stroke to make any progress. Often truth-tellers get caught in the net of 'kill the messenger' – hate Simon while being glad the contestant washes out. You're right Barbara, truth tellers are also labeled "the cold water committee." Terrific post, Maurilio. Strong truth. Good job bringing this all together. Life lessons on the streets of the Big Apple. Love it. If you believe in someone – standing for all you believe God has called them to be – if that is the motivation of your heart – then God makes a way for you to speak the truth in love. It may not turn out exactly how you like – but it turns out in the most honorable way possible. Learning more about that everyday. Looking forward to the chocolate you brought back to share with all of us! Speaking the truth in love is the only way to do it, for sure, Tami. But even that is not easily done. Great perspective. Lots of vanity sizing in NYC fashion week but didn't see any scales. Wonder that! We live in a world where people refuse to have a moral compass; a world in which people hate the concept of Right and Wrong. How can we ever become better people and build a better world where people believe that being told the truth is hateful? The fact is, there is a right and there is a wrong, whether we accept it or not. If everyone chose to live as they pleased with no believe in a right and wrong, this world will be at its end. That is the curse of society today is that we have decided to erase our Moral Compass from Existence. Who is that Moral Compass? God. Yes Tami, It is good to speak the truth in love. One thing I will love to point out though is that, as flawed as we are, we tend to react poorly to the truth. Someone could be telling you the truth in love but for the simple fact that you feel hurt by it, can make you angry at the messenger of truth. We also need to change with how we approach the truth. Jesus Christ was hated for telling the truth. Did that mean that Jesus did not love those He was sharing the truth with? No, Humans hate the truth because it exposes them. Those who sincerely seek the truth will embrace it; those who love to live in darkness will loath it. Truth is a friend to the lovers of light and a foe to the lovers of darkness. Please keep me in your prayers and pray that God's will be done. I am a first time Author and I completed my first book: Immortal Void. I am still seeking representation from a Literary Agent who represents Christian Authors. I know that being a first time Author is going to make it challenging to find an Agent but I all I can do is trust God and be patient. I have been working hard sending out query letters, proposals, sample chapters etc. Thanks for reading and please keep me in your prayers that I will find the right agent who believes in the message of the book, Immortal Void.